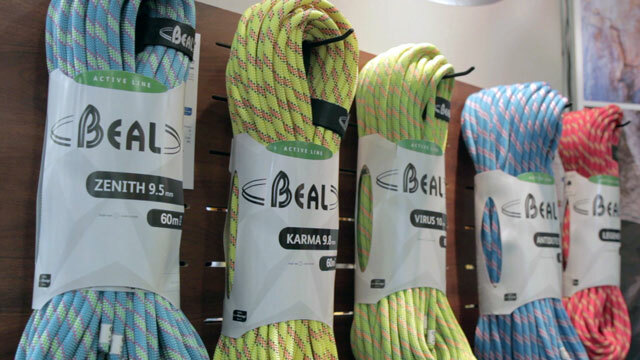 See video, pictures, and details of all the new ropes coming out in 2016 from Beal, Edelrid, Edelweiss, Maxim and Roca. Footage and photos come from the 2015 Outdoor Retailer show in Salt Lake City, Utah. The biggest theme 2016: rope line changes as manufacturers align their ropes with the new UIAA Water Repellent Certification. Beal now organizes their ropes in 3 lines: The Active line (no dry treatment), the Intensive line (sheath-only treatment), and the Mountain line (sheath & core treatment that passes the UIAA Water Repellent test). A main focus for Beal, on all rope lines, is keeping a very low impact force, under 8kN, to increase the comfort and reduce forces on gear. 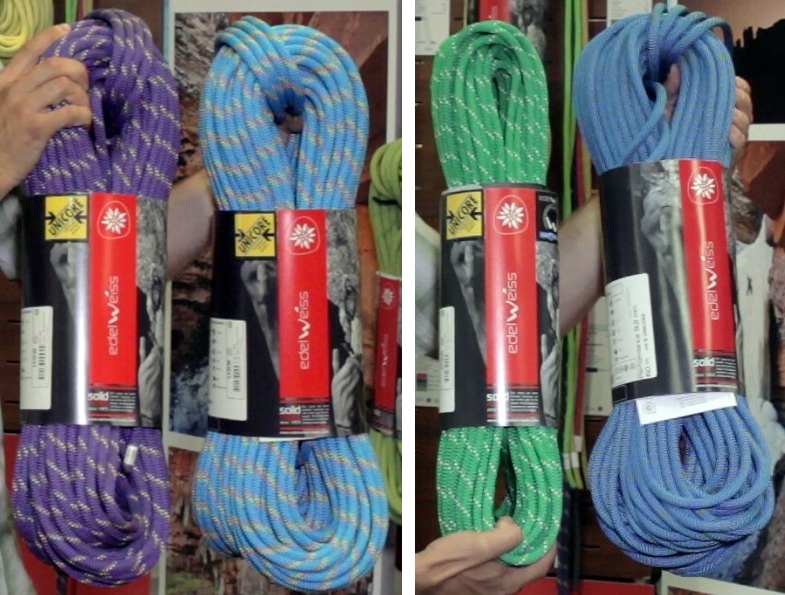 The Zenith is the thinnest rope in the Beal Active range and at $149.95 for 60m it is tied (with the Mammut Infinity) for the lowest priced non-treated 9.5mm rope. The Zenith can be used as either a lightweight sport rope or for trad, but we certainly wouldn’t recommend it for snow/ice climbing (use a Mountain line rope for that business!). Endless color options for the Boa Eco. Photo by The Alpine Start who nailed the pic. Edelrid normally makes their ropes in 1000+ meter lengths for efficiency. This practice often results in having extra yarn on the bobbins that doesn’t get used. In the past Edelrid has recycled or thrown away this remaining yarn. For spring 2016, the 9.8mm Boa Eco rope (aka 9.8mm Parrot in Europe) will be utilizing these “transfer” yarns to create totally new, incredibly colorful, unique ropes. The rope properties will be identical to that of the standard Boa rope and the price is the same as the standard Boa. Although Edelrid is using previously discarded yarns for the Boa Eco, a great cost savings, there are still a lot of process challenges to manufacture these ropes. Edelrid adds a lot of manual labor to the operation as they must change the spools more often which requires stopping the machines frequently–a high cost activity that is ideally avoided. Additionally, influenced by the new UIAA Water Repellent measure, from 2016 forward, Edelrid will only have 2 rope lines: Pro (sheath & core treated, to the UIAA standard) and Sport (no treatments). Edelrid will no longer make ropes with a sheath-only treatment. Because of this change, Edelrid is taking some of their Pro-line ropes and adding them to the Sport-line. The Swift, Eagle Light, and Anniversary DuoTec will all be available in both dry and non-dry versions in 2016. For these three models, the non-dry version will be $199 and the UIAA Dry version will be $229. The far right rope in the photo also shows the previously available 9.2mm Performance certified half, twin, and double – Unicore. Everdry: $219 each, SuperEverdry: $259 each. Each rope has a spiral core, where the core fibers are twisted together. This allows for a lower impact force and helps to keep the roundness of the rope throughout it’s life. All ropes also include Unicore. Unique to Beal and Edelweiss, the sheath and core are glued together so they cannot come apart. This is particularly helpful if the sheath of the rope is cut as it prevents the sheath and core from separating. Edelweiss Everdry (on the 10.0mm Power, 9.6mm Excess, and 9.2mm Performance) is a sheath-only treatment. The 7.8mm Elite (and 9.2mm Performance) has a SuperEverydry treatment that includes both the sheath and core, and is UIAA Water Repellent. Great photo of the “Torch” colored bi-pattern Airliner thanks to Jonathan Siegrist’s Gear Review. Maxim is adding a bi-pattern option to their 9.1mm Airliner rope, certified as a single and double(half) rope. The new bi-pattern Airliner will still have all the performance characteristics of the non-bi-pattern version and will still be super lightweight at 55 g/m. Made in Fall River, Massachusetts, the Airliner has been Maxim’s go-to rope for their athletes and climbing team. Case and point: Jonathan Siegrist (J.Star) recently did a North American tour where he travelled across the country and he did it all on one Airliner. After the tour, he took the same rope to Spain. Maxim treats the core of every rope, even their indoor ropes. For the double dry ropes (including the Airliner), they re-coat the entire rope after it is braided around the core. Even though these ropes haven’t been officially certified to the UIAA Water Repellent standard, Maxim is confident that they’ll pass the <5% water absorption test. 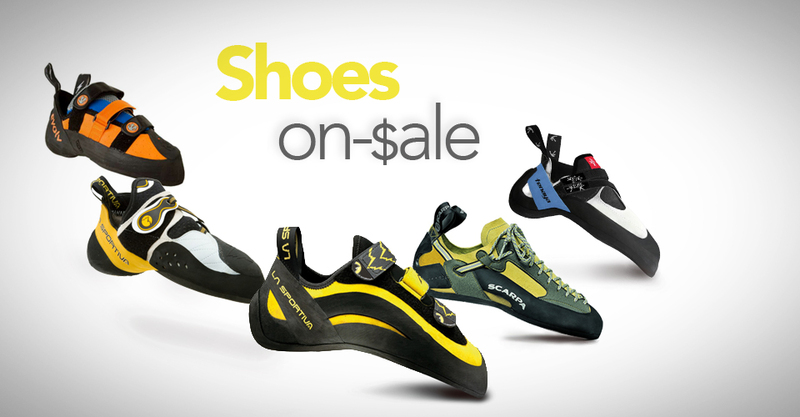 To see more new climbing gear, check out our posts on the 2016 shoes, cams, and harnesses. Thanks for sharing your experience Annie!